Heat oven to 350°F. Place pie crust in 9-inch glass pie pan as directed on box for One-Crust Filled Pie. In large bowl, mix eggs with the sugar substitute. Stir in syrup, vanilla and melted butter. Stir in pecans. Pour into pie crust. Bake 40 to 50 minutes or until filling is puffed and pie is golden brown. Cool completely, about 2 hours. Store in refrigerator. Sugar-free pecan pie may seem like an oxymoron but we assure you, it’s possible, do-able and delicious. Whether you’re making a lifestyle change, have a dietary restriction or have guests who prefer sugar-free recipes, this dessert is exactly what you need to still indulge but stay mindful of the whole sugar-free thing. It relies on sugar-free syrup and a sugar substitute for that sweetness you crave. You could also use honey or Karo instead of breakfast syrup if you’re looking to cut down on the sugar. 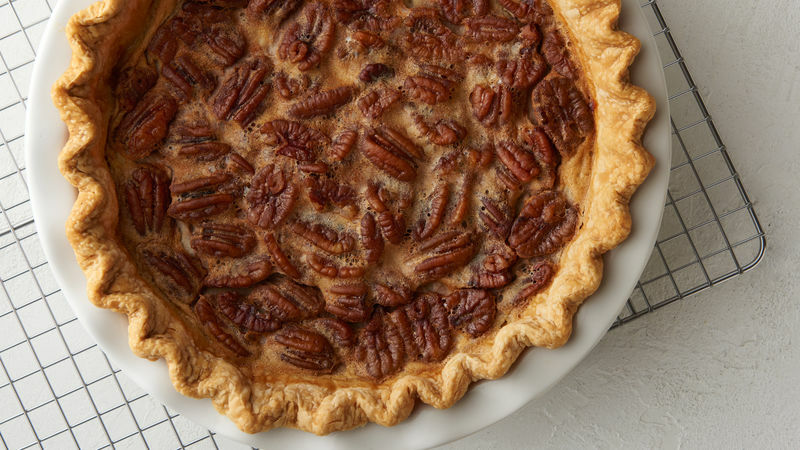 This pecan pie is proof that you can still enjoy the foods you love, especially around the holidays, and still adhere to your food lifestyle. You can find more sugar-free recipes here —it’s never too early to start planning for holiday baking, especially when you have guests with different diets, health and habits.